I managed to finish page 22 before the end of February! I have been trying to remember to post at least once a month, but when there isn't much progress, it is a little discouraging! I have 1 more full page and 2 partial pages left! Anne said she wanted to offer a giveaway for February!!! We are blessed to have so many generous and talented members! Winner of the February drawing will receive this lovely set she hand-painted on white china. THANK YOU SO MUCH ANNE FOR THIS INCREDIBLE SURPRISE!!! Last week DH and I went for a few days trip to Germany. We had a perfect time together, you can see pictures on my blog. 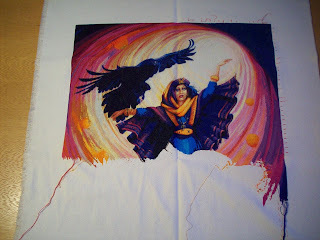 I had some extra stitching time and decided to take Call of the Raven with me. Here's a picture of January 31st. It's the end of the month and I'm only just now updating my Ice dragon King..yikes where does the time go???? 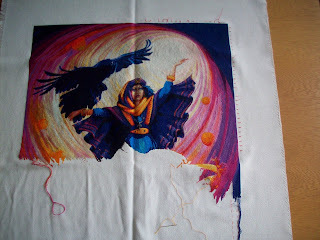 As you can see I have been stitching...not as much blogging. My commentator barely works so I'm looking in at all of the lovely works going on. I'm not in the position to get this blinking thing fixed right now..but soon. I may have to restart my blogger site. We'll see! Have a great day and Stitch with happy fingers! And here is where I ended this month. I will be rotating to Fantasies of the Seas next month. Everyone's work is looking really nice. Thanks for looking. it's the end of the month and here I am with another progress of my 'gothic rose'. 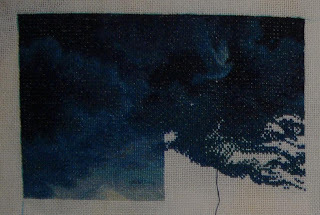 happy weekend to all of you and a lot of time to stitch! 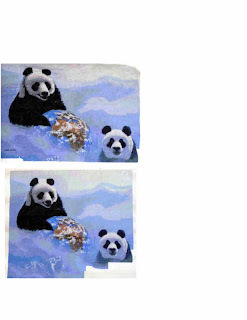 The pandas are doing their best to look important and able to withstand another 6-8 months of stitching before they can be hung on the wall. Soon I really hope to start on the trees so that I can use some color other than blue. The WIPs that you are posting look great. Some of you are moving along at a fast rate. 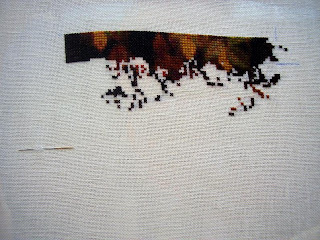 Even though I can stitch every day it still seems pretty slow. 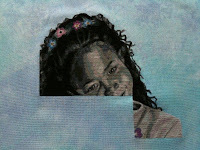 Have a great week stitching. See you next week. From My Buddy Valerie J. Here is my third full page. I am very glad to starting seeing the girl's face. I really like this drawing. Your works are all beautiful and I want to congratulate you all. Just before I leave for Germany for a short holiday I wanted to show some progress on a new start: Foregone. It's kind of boring, all browns, but isn't all the beginning that way? 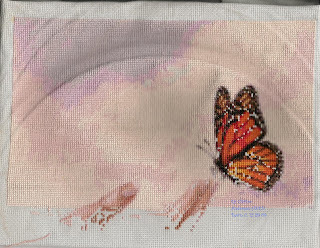 I've done about 2700 stitches, I think. The tail of the The Sifter is almost completely finished. A lot of black and green (500) I've had many treads DMC into this. Three half boring pages to go and then it is finished. I'm just busy with more cheerful stuf. 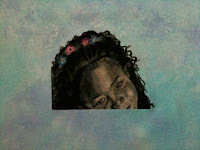 I would like to start the Medusa of L.A Williams or The Rose of JC Christensen. But even this one first finishing because I really do not like half work. Hi friends , I started my Fall Fairy of Ruth Sanderson ! 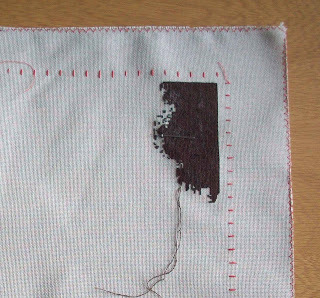 My fabric is 32ct linen and I stitch 2x2! My mother do not like this but I love it! There is not much to see, just some leaves with autumn colors, but I'll do it slowly but surely! Look! You can actually see the progress this time! I've got almost half a page done! Only 55 half pages left. LOL! This is my first HAED. I have another 10 designs kitted up and waiting for their curtains to go up. What was I thinking? Everyone's postings are beautiful and so inspiring and motivating. Congrats on all the progress. This has got to be one of the best blogs on the net. Dragon Knot - Halfway Through! 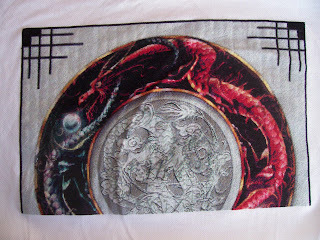 Yesterday, 2/16/2010, I finished page 8 of 16 of Dragon Knot 2. Yippee!!! 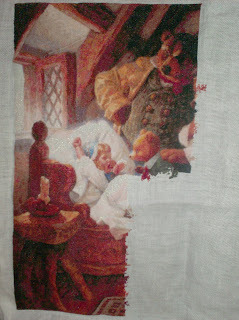 am glad to be working on it again! 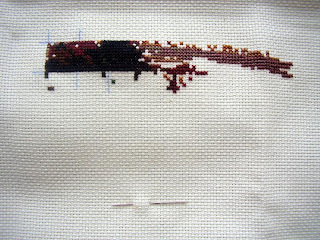 Just to prove I still exist, and so that I can enter the give-a-way, here's a little progress picture. 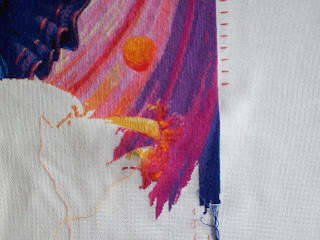 I want to commend those of you who are stitching up a storm! I love to see your progress! Beautiful work by all of you!!!!! Just a message to let you all know I'm still here :) It is so quiet on this blog, I wondered if I could see all the messages. 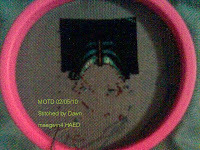 I have been stitching on several things lately, but no much progress on my HAEDS. 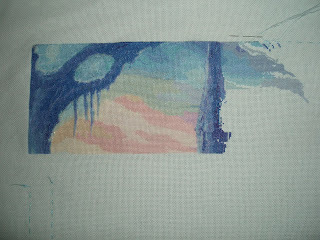 Vibrant Vista is taking a rest, I started Storykeep Elfland, but its progress is not worth showing. Also Forgone is getting slow. I finished a small page, but it's all in brown, so a little boring. As soon as I added some colours I will post a picture. WOW I can't believe I won Jan's Giveaway, thank you so much Marie :) I have asked for Train Of Dreams. I don't know when I'll get around to starting it, probably sooner rather than later lol. After pic...the flash caused whiteout again but the pic's without were blurry! I'm sticking with this for the rest of the week so that I can at least get this half a page finished. Thanks for reading and commenting ladies. Maxine So Much Stash - Sew Little Time my blog. Have a great day ladies-happy stitching! Hi everyone. I realised that it had been almost a month since I posted a progress of my Angel of Spring. I have a great excuse though..... too much snow falling in Denmark! I might be a big fan of b&w but I got so excited when I started to stitch some colours (the flowers) on her chest. 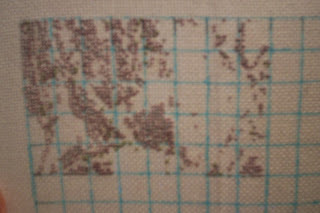 2400 stitches more to go and this page can be go into the snow outside my house. 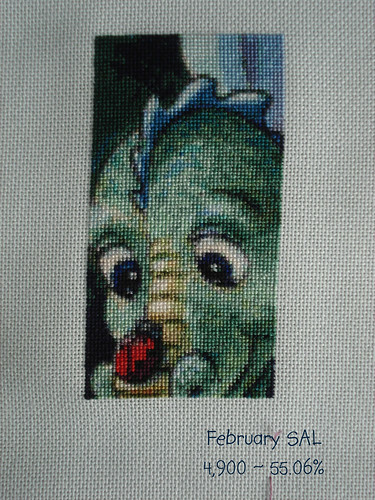 Finished page 1 of SK Dragon Luck :) Can't wait for April when page 2 will be sent out. 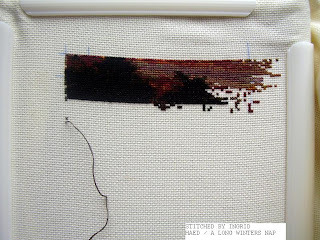 Hi my stitching friends, here an update on "a long winters nap" I am a very slow stitcher as you can see, but I'm still working on different projects and sometimes I even change! Very soon I start my Fall Fairy by Ruth Sanderson! Finally firmly worked at the Sifter. I have done much. But I must say that of course is much the same color. So that is many times faster than confettie stittching. Yesterday our youngest son moved. All day on the job. Everyone went home very tired. And now I have muscle pain all over. It is very strange to be in his empty room. But it will get used. I'm redecorating this room. Red wallpaper I is not pretty. And then I can stitch, sew, watch TV and internet in this room. You have won your choice of a chart from HAED (any chart, you choose). Thanks again to Marie for this surprise!!! And Maxine, don't forget to let us know what chart you pick! Faery tales is coming along slowly. I decided to go ahead and start page 9. 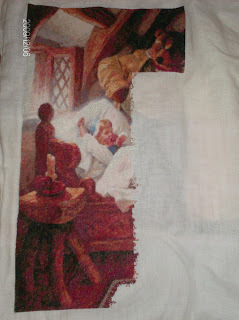 I just couldn't wait to stitch Cinderella and her prince. 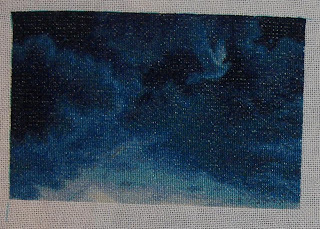 For now, I will have to stitch more night sky until I finally get to the castle and thier moonlight dance. I just spent a half hour going over all the beautiful posts you all have been making. Sooooo many beautiful designs, you are -- each and every one of you -- Enablers of the First Degree!! Thank you for sharing your wonderful designs and beautiful stitching with us. 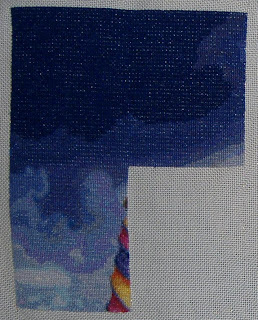 I have managed to get about 1200 new stitches into Dreams of Atlantis since Christmas. Not much, but it keeps me coming back (LOL). Thanks for looking. Here is QS Dragon Soul that Im working on now. Everyone's updates are fantastic and I always check everyday to see if their is anything new and my wish list just keeps growing. 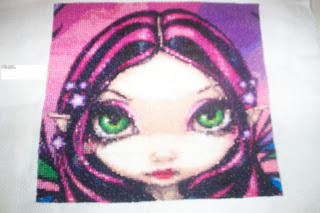 Here is my update on Faery Tales. I am up to page 11. 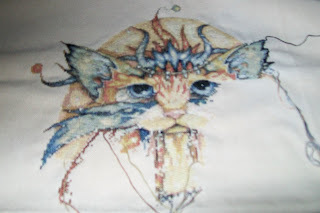 I know, it's been a long time... but I stitched a lot, you'll see! I'm so happy, I can see the young bear now... And the colors of his shirt are so beautiful. Thank you so much Heaven and Earth Designs for your great job. I know that your designs will always be a part of my precious stitching time. All of you girls did a great job on your stitching, keep up the good work! Valérie, from Quebec with a -22 Fahrenheit outside BBBrrrrrr! I can't wait until spring. I am always so happy to be part of your blog and see your wonderful pictures. This is the second picture of Xmas. Two pages completed! 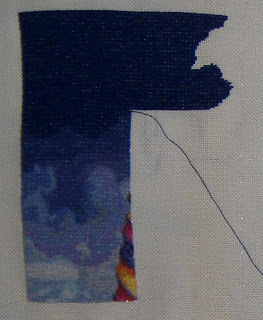 I am only embroidering this chart, I love her so much. I will comment soon and continue to send great pictures of your beautiful works, I love them! 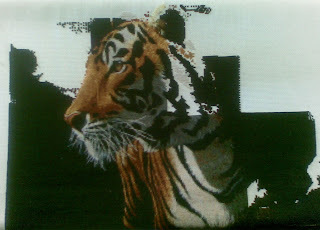 I completed the page with most of the tigers head. I have been having disrupted sleep lately so I have been tired so I have been doing a lot of the black because it is easier... 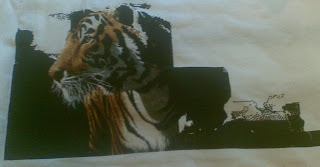 I can't wait to finish the tigers head but there is a way to go including more confetti!